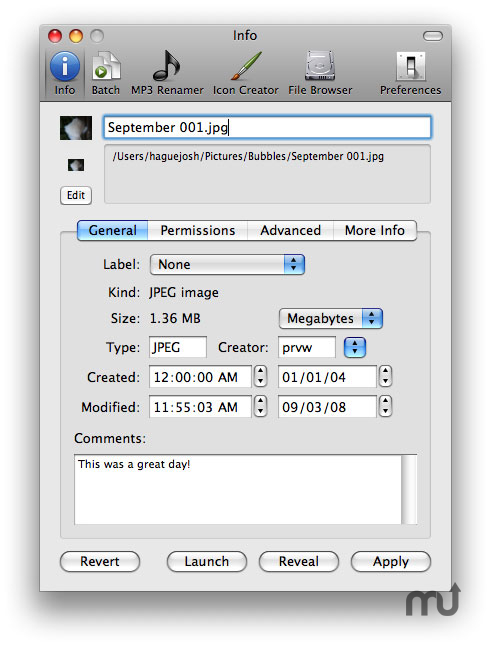 Generate icon previews, rename MP3s, edit hidden file options. Is there a better alternative to File Sheriff? Is File Sheriff really the best app in File Management category? Will File Sheriff work good on macOS 10.13.4? File Sheriff needs a rating. Be the first to rate this app and get the discussion started! Managing files with the Finder in OS X can only take you so far. File Sheriff allows you to easily generate icon previews, rename your MP3 files based on their ID3 tags, batch-apply file attributes, edit hidden file options, and more! Long past are the days of having to fiddle with type and creators in Mac OS 9 to get files to launch in the correct application. Today, we're dealing with a mixture of file extensions and the Finder has that handled pretty well! However, it's still lacking the ability to give you full control over some of the advanced features files offer. With File Sheriff, set the bundle bit, custom icon setting, visibility, and more of any file or folder! So many of us have thousands of MP3s cluttering our hard drives, and rely on iTunes to save us when we need to find one in a flash. However, sometimes filenames for MP3s are either garbled or simply incorrect! File Sheriff can automatically rename your MP3s based on their ID3 tags (what shows in iTunes), so you won't make any mistake which song is which. Lastly, File Sheriff also offers an Icon Creator. This allows you to specify a folder of pictures, movies, text files, or other compatible media and have icons automatically created for them. The Finder in OS X offers an Icon Previews option, but it's slow and recreates the previews each time you open the folder. With our Icon Creator, run it once and never worry about it again.